We hope your family had a great halloween! Our family had a wonderful and unseasonably warm halloween. Did anyone else notice how warm it was this halloween compared to last halloween? Gotta love global warming! Here is a picture of our family on halloween minus my brother, Jacob (he was too cool for Halloween this year). Ella was a flapper, Leah was a snow queen and I (Kelly) was a jellyfish that my mom and I made. 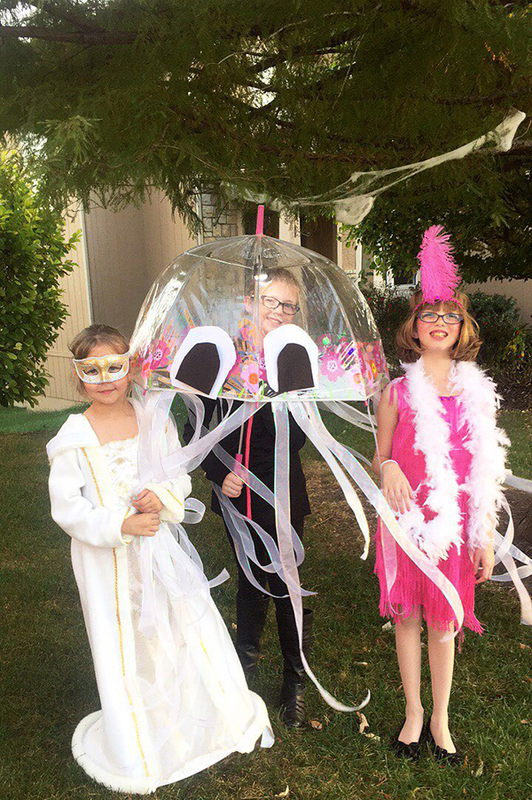 We got the idea for the jellyfish costume from this blog post. Isn’t it great? We raked it in on Halloween this year, as we trick-or-treated for a couple of hours and visited a ton of houses. Between the three of us, we had soooo much candy! When it comes to halloween candy, my sisters and I really love the fruity candy and the chocolate candy is always what’s left in our bags. Our mom kept telling us to get rid of the candy or hide it somewhere because she didn’t want it laying around our house (she has a bit of a sweet tooth and I think it was too much temptation for her!). We took our moms advice and decided to make some sugar cookie bars with the leftover halloween candy bars. 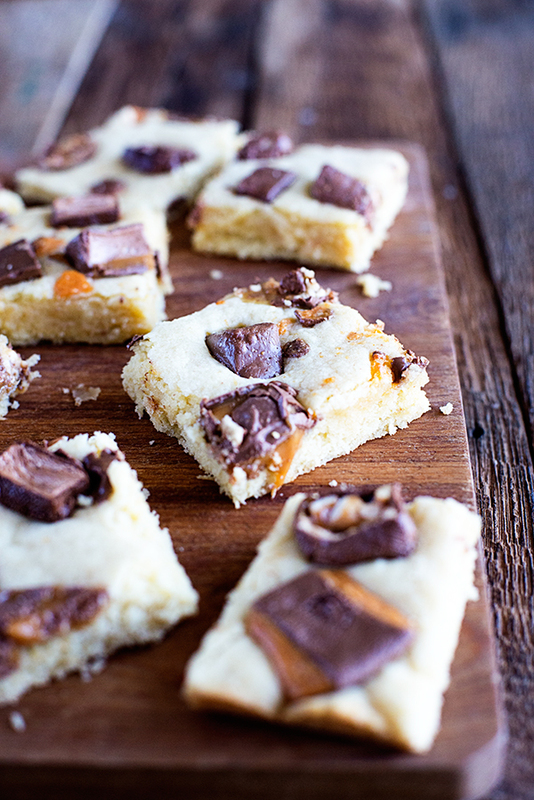 We loved making these cookie bars. In fact they were so good we doubled the recipe so that we could make more (and get rid of more halloween candy) so that was really good. This was the perfect way to get rid of it. 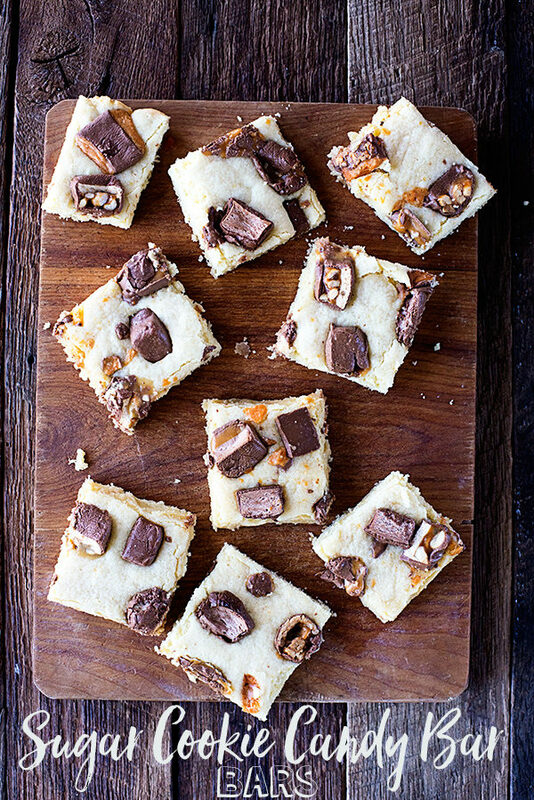 If you have leftover halloween candy (or just want to go buy chocolate bars), I highly recommend giving these Sugar Cookie Candy Bar Bars a try! Taste: These were delicious. I would only make them with candy bars that go together which is what we did so be sure to choose whatever you like. Looks: These look very good. I was worried that the chocolate would melt but it did not so it made me happy! Taste: Really good! The Halloween Candy was a really nice way to top these sugar cookie bars off. Look: Yummy! I love candy so the candy on top tempted me to eat it. 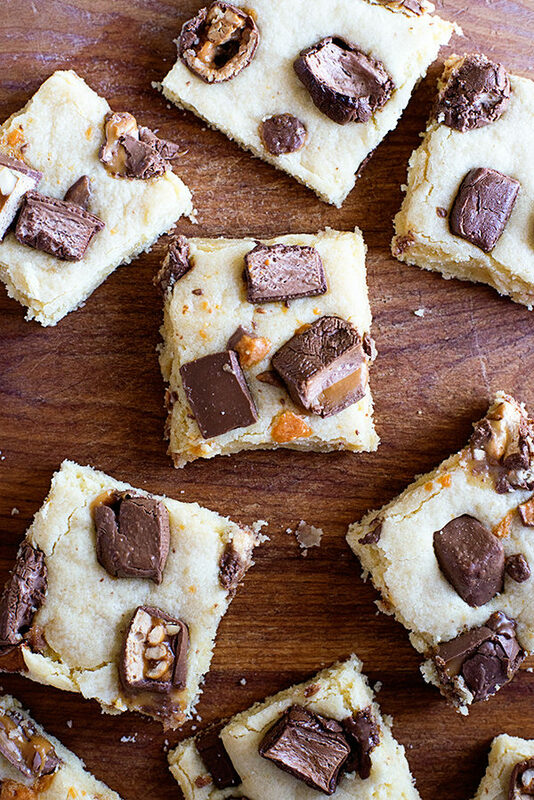 Use your leftover halloween candy to make these Sugar Cookie Candy Bar Bars. In a large bowl, cream together butter, granulated sugar and powdered sugar until light and fluffy. Add the eggs and vanilla and mix for 1-2 minutes. Stir in the lemon zest, flour, baking powder and salt. Mix until combined. Lightly grease a 11x13 inch cookie/bar pan with cooking spray (we like to use Pam Baking Spray). Press and spread the cookie mixture gently into an even layer into the bottom of the pan. Gently press the candy bars into the cookie batter, making sure they are evenly distributed. Bake for 13-15 minutes until the candy bars have begun to melt. Do not overbake. The cookie bars shouldn't have any color around the edges and barely be set in the middle. Cool completely before cutting and serving. You ladies can just pass all that chocolate candy to me! Kids who don’t like chocolate? 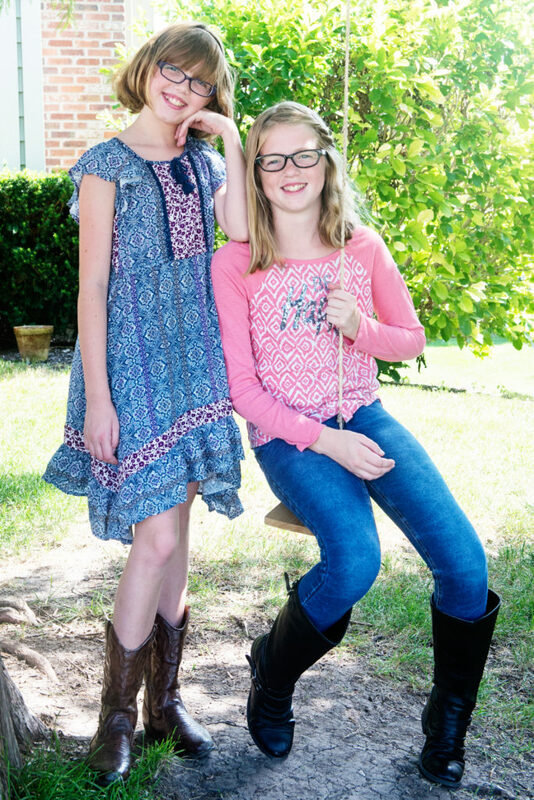 I think your mom must have tricked you when you were little so she could steal all of the Reeses and Snickers and leave you with the suckers.